I love a good rocket salad. This version uses a few extra steps to make the most of the simple ingredients, resulting in a stunning salad that will steal the show. Halve tomatoes and place on a baking tray, cut-sides up. Drizzle with olive oil and season generously with salt and pepper. Bake for 2‒3 hrs at 120°C, depending on the size of the tomatoes, until semi-dried. Pack any leftovers into a jar and pour over olive oil and refrigerate for 1‒2 weeks. Add these to pasta sauce, on pizza, with baby mozzarella on a crostini. Line a baking tray with baking paper. Place rounds of grated Parmesan cheese on the tray and bake at 180°C for 4‒5 minutes. The cheese will have melted and be just starting to colour. Allow to cool and store in an airtight container until ready to use. Place the balsamic vinegar and brown sugar in a small pot. Heat and simmer until the vinegar has reduced by half and is a thick syrup. 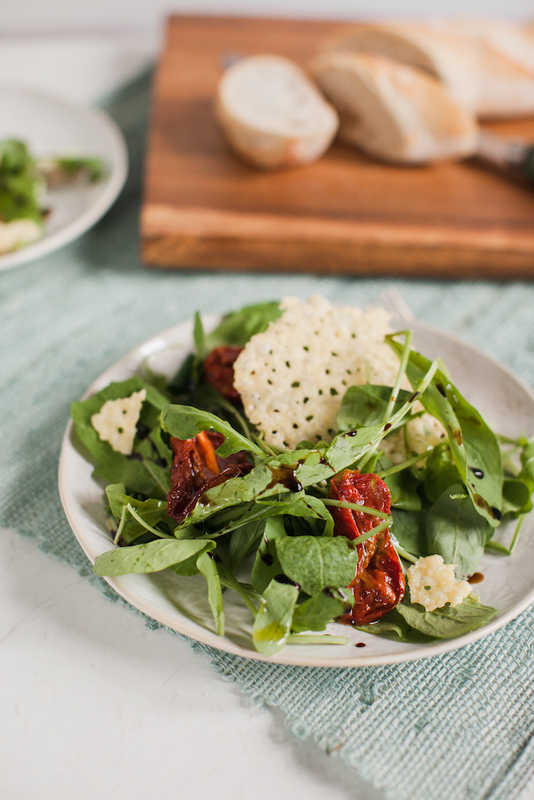 To assemble the salad toss the rocket and semi dried tomatoes together, place on a plate or platter before drizzling with the balsamic reduction and topping with the Parmesan wafers.